Uncategorized Archives - Randi Hutter Epstein M.D. M.P.H. This happened to me twice when I was reading The Scar, Mary Cregan’s engrossing memoir. A friend came by to say “hi” and, each time, I nearly jumped out of my seat. I was, both times, in a bustling café and so absorbed in the writing that I forgot where I was until the sound of my name jolted me back to reality and my drink nearly went flying. A writer-friend calls that kind of immersion a “fictional dream.” It’s when the words chauffeur you into the author’s imaginary world. The Scar is non-fiction but it pulls you in all the same. Cregan writes about her spiral into suicidal depression that began after her daughter’s death. Anna was born on a Sunday morning in 1983. The Apgar score (a quick assessment of a newborn’s overall health) was low. Anna’s body temperature didn’t return to normal after her first bath. When the nurse held her, the frail infant legs dangled limply. Anna had a fatal heart defect. She died within days of her birth. 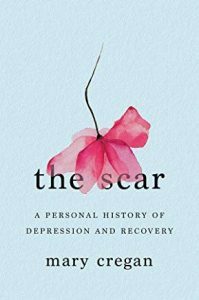 The Scar takes us along on Cregan’s journey during the aftermath of the baby’s death: Cregan’s hospitalization, attempted suicide; and her treatments that included electroshock therapy, drugs and talk therapy. She even reveals bits written about her from the doctor’s medical records. Despite the horrific circumstances, there’s little self-pity. It’s as if she’s staring at her younger self, like a medical detective, trying to make sense of it all. Why couldn’t she grieve and move on? Was it brain chemistry gone awry? Some kind of vulnerable genes inherited from her family? Cregan’s focus is tight and vivid as she describes her own crises, her hospitalizations and path to recovery. But amidst her personal story, she opens the aperture to discuss the science and history of each therapy; the broader implications of treatments. Benjamin Franklin toyed with electricity as a way to help those with severe melancholia but he wasn’t as convinced with its potential. The Scar is a heart wrenching, smart read that sheds a light on a dark subject. Cregan, who has a PhD in English from Columbia University and currently teaches at Barnard, sprinkles the book with literary references and lines of poetry. It offers the reader a chance to perceive mental illness from another prism. 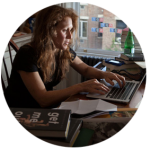 Those who have experienced the kind of emotional trauma that Cregan describes—some 15 million Americans have had at least one bout with major depression—will find company in her memoir, solace in her words. The rest of us can learn not only about her story but how many psychiatric drugs and treatments came to be. In the years leading up to the Civil War, about a dozen or so female slaves were part of a series of gruesome experiments that culminated in a huge advance in gynecology. They were operated on over and over in a ramshackle shed in Dr. J. Marion Sims’ Alabama backyard. Sims was determined to figure out a way to heal vaginal tears caused by long labors. He succeeded and became world famous. In addition to his surgical cure—a technique that would spare women worldwide some of the ravaging consequences of giving birth—Sims also invented the speculum and founded a woman’s hospital in New York. For more than a century he was hailed as one of the great humanitarian physicians. For years, the story of J. Marion Sims focused on his achievements. But lately, his story has been revived without glossing over his journey to prominence, culminating not only in heated discussions. Yet, however the story is told, the spotlight has always been on Dr. Sims. Harriet A. Washington wrote about him in Medical Apartheid. Her book along with subsequent articles prompted protests that resulted in the removal of a Sims statue that had been on Fifth Avenue in New York City. Deborah Kuhn McGregor wrote about him in From Midwives to Medicine. I also wrote about Sims and his legacy in Get Me Out: A History of Childbirth from the Garden of Eden to the Sperm Bank. But who are these women? There are no diaries, nothing about what they had to say. We know the names of three of them. Lucy. Betsey. Anarcha. So when we write, they become two-dimensional, lumped together in one group: “The slave women.” To be sure, Washington dug deep to bring a voice to Anarcha Wescott, but so many of the women have remained anonymous because we just don’t have the information. Now, Charly Evon Simpson, a playwright, has given voice to the voiceless. 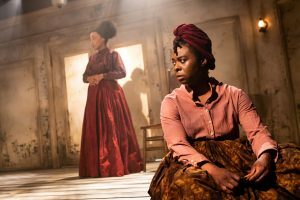 Her new play, Behind the Sheet, is inspired by the real events allowing her to shift the spotlight from Simms to the slaves. We meet these young pregnant slaves who endured operations—some of them had up to 30 surgeries. But for the first time we are forced to imagine them in three dimensions, as yearning, bonding, compassionate, jealous, hurting women. Simpson gives these women agency. While some of the dialogue is lifted right from J. Marion Sim’s autobiography, Simpson adds a plot twist. In her play, the doctor is George Barry. We also meet Philomena, his assistant/pregnant mistress/slave. In real life, there was no Philomena. Or rather, there’s no record of Sims having a mistress or impregnating a slave. I found the injected storyline added heft to the play—we see his own mistress suffering and we see happens to her after her child with him causes her to suffer from tears. We see what happens to her after Sims finds his cure and heads north. The night I went, there were audible gasps from the audience. The woman behind me sobbed. I assumed people went for the reason I did. We knew the story and were curious to know how this fictionalized version would come alive on stage. But perhaps this was news to some of them. And that’s a good thing. This is an important chapter in medical history that needs to be debated in wide circles outside of academia. Behind the Sheet had sold-out performances at the Ensemble Studio Theatre and is now extended until March 10th. Here’s more information about the show. Having spent most of my career on college campuses (I’ve basically never left since I got my undergraduate degree in 1984), I’ve had the opportunity to meet amazing students. Their list of achievements never ceases to astonish me. But at the same time, their remarkable successes concern me. I worry that in their race to collect awards to bloat their already swollen resumes, they lose sight of the point of it all. What will happen when everything they do isn’t graded? What will happen when they reach their goals but there’s not another award in sight? How will they find fulfillment? When we were younger, my sister wanted a hamster, but my parents were quick to deny her request. They had heard too many frustrated stories from other parents who were annoyed by the critter’s incessant spinning in place. They found the hamsters’ habit of tirelessly chasing the ladder in front of its eyes to be pointless, and so they figured, not interesting, for a pet. Ten years out, it baffles me that the quality my parents rejected in a hamster is what we are now embracing as a society. When I look around, I see young people, like my peers and me, running on our own wheels, pursuing fleeting goals with no real end or pauses in sight. The National College Health Assessment reported recently that 60% of current college students felt “extreme anxiety” within the last two months of the survey. Younger generations, the Gen Z-ers and millennials, consistently report the highest levels of stress compared to any other generation so far. The number should shock me. But it doesn’t. It’s because what my generation often takes pride in is our relentless ability to collect accomplishments. We win some and then wake up the next day to keep winning some more. We don’t take breaks; we are constantly plugged in, constantly accessible, and constantly on the go. Our drive is applaudable. It brings about innovation, inventions and positive changes in our world. But it comes at the cost of our own sanity. When I started medical school last year, I felt immense pride for all the hard work, sweat and tears that went into getting admitted. I beamed at the white coat ceremony, excited to enter training for a profession that I had been dreaming of for years. My enthusiasm, though, was short-lived. One week into school and I moved on from my “win” and was already thinking of goals that lay ahead. What research should I do? What was my strategy for the next time I would have to apply and get admitted? In other words, what was going to be my next set of accomplishments that would shine on my wall, lead to respect, and maybe give me the same rush of excitement that I had gotten when I got my letter of acceptance. This story, consciously or subconsciously, applies to almost everyone I know. We are running and running, until the thrill of the chase turns to utter stress, which morphs (for three out of five) into a health hazard: extreme anxiety. The irony, for me, is that I’m training to be a healer. So, to prevent this pervasive culture from seeping into my life, here’s my new goal: I vow to create time for “reset weekends”. 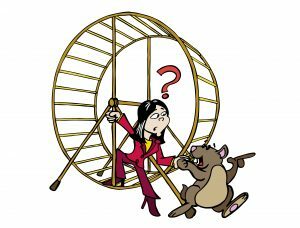 Once every month or two, I disconnect from my work completely; I hop off my hamster wheel and just sit in my cage. I go and find hobbies and passions that give me as much satisfaction as the thought of winning or accomplishing does. On my last reset weekend, I played badminton with my family, checked my phone a mere 4 times that day (a decrease of about 196% ), journaled extensively for 3 hours, and read a novel that had been on my mind for months. These weekends strengthen my drive. I retune by reflecting on my actions and why the goals I am chasing are meaningful. I pause the journey, and make sure that I am not just spinning, but rather moving forward in a meaningful and satisfying way. Resetting doesn’t have to be entire weekends; it can be a day, or mere hours—as long as the time reprograms the pursuit and revitalizes it to be more meaningful. One of my friends resets by taking week long vacations twice a year. Although not frequent enough and too long for my taste, it works for him. He is incredibly productive, healthy, and content. Just imagine this: what if each one of us took moments to hop off the hamster wheel to celebrate, to feast, and to appreciate how far our hard work has taken us. Then rather than downtrodden hamsters fatigued by the constant squeak, squeak, squeak, we all stepped on again, refueled, reenergized, and re-motivated. This morning, NPR reported on the United Nation’s recent and “sobering” new report about climate change, saying that we are doomed to live in dangerous conditions unless new technologies can remove greenhouse gasses from the atmosphere. 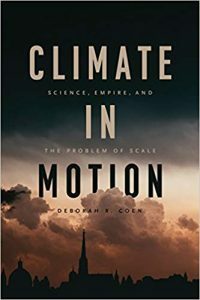 For anyone writing or thinking about climate change issues today, it would be worth your while to pick up Deborah Coen’s Climate in Motion: Science, Empire and the Problem of Scale. Of course, for me, the fun facts were the ones that had to do with medicine. In the early 1900s, scientists created devices to record factors in the environment that were linked to health, such as measuring ultraviolet radiation, ozone levels, and the “feel” of temperature. Humidity was measured using none other than a strand of hair. Scientists back then realized what women have probably known for millennial: your hair gets frizzy in sticky weather. But here’s what most of us didn’t know: The way humidity effects the length of a strand of hair is standardized, meaning that you can calculate the amount of humidity based on how much hair shrinks or lengthens. It’s not willy-nilly but linked to the amount of moisture in the air. Thus came the Hair Hygrometer. Here’s a piece in Scientific American about how to make your own hair Hygrometer using rubbing alcohol, cotton and other household items. Around the same time, scientists started to worry about the impact of deforestation, urbanization, and the draining of wetlands on climate. In other words, as Coen explains, these 19th century experts worried about the human impact on climate. Doctors, she writes, believed that climate had a powerful influence on human sexual function. Coen writes why this 19th century tumult matters today in this recent piece in The Conversation. They even prescribed climatic cures to relieve their ailments. Their fears fomented into political infighting—that often had nothing to do with the science but more to do with assumptions, egos, and short-term solutions to development. Sound familiar? We tend to think of the placenta as a sponge that transfers the mom’s nutrients to the growing fetus—if we think about the placenta at all. Emerging research has been showing that this oft-ignored organ is a lot more complicated than we ever imagined. As a neonatologist explained to me recently, the growing fetus’s nutrient needs change on a day-to-day basis. Somehow, the placenta knows just the right amount of this or that bit of nourishment to provide. It’s a stunning feat. This month’s Scientific American reports on a study that shows that the body is programmed for symmetry. (The original research was published in PLOS Biology) Researchers injected a substance into a mouse fetus that restricted the growth of one leg. 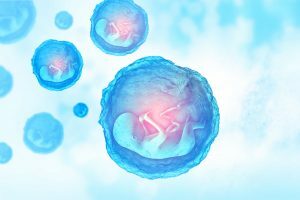 They found that somehow, the cells surrounding the suppressed tissue sent a signal to the placenta to slow growth in the other leg. The study focuses on the ability to maintain symmetry. I also think it’s another shout-out to the remarkable abilities of the placenta.